I emerged in 2011 from something of a bubble. Sure, I’d continued to publish a novel each year since my debut with The Kommandant’s Girl in 2007, but I did so in the blur of having one wedding, three babies, two house moves, two changes in the day job…you get the idea. When I came back out into the world, I was wholly unprepared for the brave new world of book publishing. All the old measures of a book’s potential and actual success were gone or greatly diminished in importance. A sizeable print run? Much smaller now with e-books. My beloved Quill Awards, for which my first novel had once been nominated? They no longer exist. Author appearances at Book Expo and regional trade shows? Seemingly less important. Borders was on life-support. Still other questions persisted: Does co-op (the space in the front of the bookstore where new releases are displayed) still matter if everyone is buying e-books? What about the pre-publication reviews from Publisher’s Weekly and Kirkus? I felt like Ichabod Crane waking up years later to find the world as he’d known it had disappeared while he slept. Except in this brave new world, we all seem to be Crane -- kinda clueless and trying to figure out the rules of an ever-changing game while the pieces continue to move beneath out feet. As I began to study the book business in earnest in preparation for my latest, The Things We Cherished, one certain trend began to emerge: the empowerment of the reader. With so many writers self-publishing, the publishers seem less in control. There are endless avenues for authors to reach out directly to readers, diminishing the importance of traditional conduits such as the media. And it sure isn’t about the brick and mortar stores. No, it’s the readers, driving the online communities by the many thousands, using the new media to promote the books they love by word of mouth. The reader is king (or queen) and not just the readers with the big blogs. Everybody’s voice can be heard and I love it. At the same time, I find it rather confusing. There are a million books, self published and traditional. There are also dozens of sites beyond Goodreads and Librarything and as I post the same content over again on each site I cannot help but wonder if I’m reaching anyone new or just the same folks on multiple pages. And more importantly am I reaching anyone deeper? I’ve heard of some towns and cities having “One community, one book” reading programs. Can’t we have one site for readers and writers to meet and really talk? Or maybe not, since the online reading communities are diverse as the readers themselves. And with all of the changes, some of the old questions persist. Just like when I sat down with those book clubs years ago (usually by skype these days) whether they want to hear about the book or about me, or maybe just have me hear about themselves and their reactions to my work. So I turn the question back to you, dear readers: How best to reach you? And what do you want to hear from us? 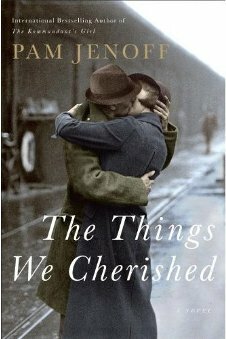 Pam Jenoff is the author The Things We Cherished an ambitious novel that spans decades and continents, The Things We Cherished tells the story of Charlotte Gold and Jack Harrington, two fiercely independent attor­eys who find themselves slowly falling for one another while working to defend the brother of a Holocaust hero against allegations of World War II–era war crimes. Rich in historical detail, Jenoff’s astonishing new work is a testament to true love under the worst of circumstances. You can learn more about her on her website.